“Hi Geof, Your complaint regarding the Taxi in the cycle lane has been received by the parking compliance team. I can assure you that Taxis do not have permission to park in Cycle lanes and could receive an infringement notice if sighted by one of our officers. The moral of the story is: put the Council’s parking enforcement number in your cellphone for on-the-spot response! How often have you seen dodgy parking in a cycleway? Have you done anything about it? They may or may not be able to issue an infringment notice on the basis of a photo. But they should certainly be able to contact the taxi operator and “have a little chat” – make sure the driver is aware of the road rules, and put him on notice. I’d have at least one like that a week, if not more. Here’s one from this morning, in Waterloo Road. But its okay cos he has his hazard lights on ! I’ve contacted Gold Band at https://www.goldbandtaxis.co.nz/contact/ and will let you know the outcome. Thank you for your email. I apologise for this experience and can confirm that to the best of my knowledge authority to park in cycle lanes has not been granted. Your photo is sufficient to allow us to track down this driver and speak with him directly. We will also ensure messages go out through our dispatch system to remind drivers of their obligations when it comes to cycleways etc. Once again, thank you for bringing this to our attention. This was at 11.30 last night – council not “on line” then by the looks of things. They could easily have parked on the grass. That video of police parking up in the cycleway is terrible, you should send it in to them and see what how they respond. I can’t watch your video Steve. If that taxi was gold band, then they have been informed. Twice last year witnessed this, first time informed taxi firm, who said they can park in cycle lanes to pick up passages and the second spoke to council who said they will inform gold band it is not alright to park in cycle lanes. Looks like it didn’t get through to gold band. Photo of taxi and taxi number can be sent to police as long as you have 30 min to full in complaint form and they will be fined not by council but by transport agency for knowingly blocking carriage way.Apart from that there is little else to do legally. 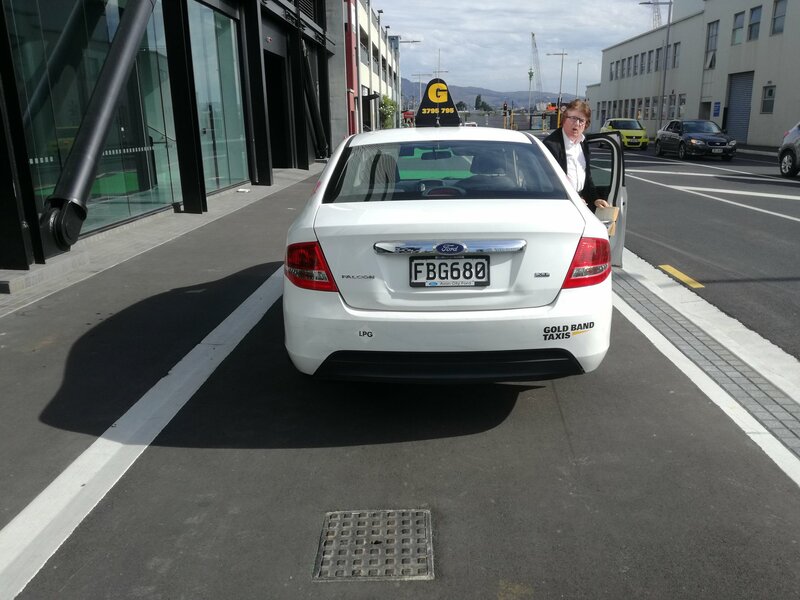 Today a wheelchair user had to cross the road and back three times to travel around vehicles parked over the footpath on one busy street. two of the vehicles had company logos. That snap send solve app is about to be well used. Cyclists and wheelchair users not only use shared paths, we also face some of the same challenges and have the same tools to sort it out. The same people who create these obstacles on cycleways, park on footpaths. By sticking up for cycleways, you’re sticking up for those who rely on the footpaths. Photographed another Gold Band Taxi (LFW910) parked in the same spot this morning during my commute into work. Both Gold Band and The Council have been contacted. Previous Previous post: Wanted: Your contributions! Criggie on Guest Post: Are the Demographics of Cyclists Changing? Anne-Marie on Guest Post: Are the Demographics of Cyclists Changing? Mac Man on Guest Post: Are the Demographics of Cyclists Changing? 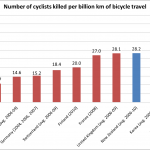 Robert on Guest Post: Are the Demographics of Cyclists Changing?